Going for a Borneo holiday in Sabah Borneo has been a dream to most of the travelers out there, especially those who are wildlife and nature lovers. There are some travelers or professional photographer, willing to visit Borneo Island just for travel photography activity, as they find Borneo Island an exquisite place in the world to capture the wonderful pictures of wildlife and nature. Unfortunately, some of us are not professional photographers, but we do love taking pictures of our travel at Borneo Island. As the “newbie” of a travel photographer, packing the essential items for photography is our main concern, because we would want to pack light rather than overpack when traveling. Therefore, we should limit some of the photography items that can fit in our carry-on bags, that are equipped with anti-theft and water-resistant features. So, what kind of essential items that are fit for us being the”newbie” travel photographer in Borneo, as well as cutting down the weight of our luggage? Since we will be traveling, capturing photos of the places we go is kind of part and parcel for traveling. We can just use our own smartphone or a compact digital camera that can carry around easily while walking around Kota Kinabalu, the capital city of Sabah Borneo. Unfortunately, we won’t be able to beautifully capture many different scenes in Sabah Borneo by using only our smartphone or compact digital camera. When going for Sabah Borneo rainforest or river, it would be best to bring a Digital Single-Lens Reflex (DSLR) camera to capture some great sharp images. Who knows, we might spot some rare plants or wildlife while jungle trekking in the Borneo rainforest. 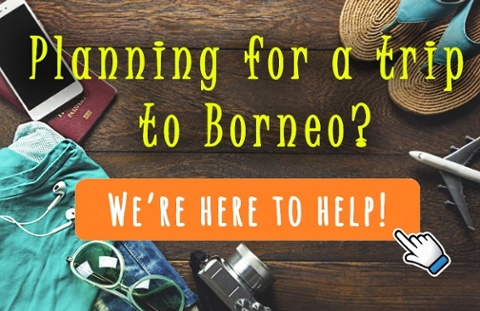 Planning to capture travel video blog in Sabah Borneo? Using a GoPro to capture our diving adventure in Sipadan Island, because it is light, small, and the image quality is remarkably good. However, this is depending on our own budget and needs to choose the suitable camera. Usually, cameras are available to purchase without the lens. Thus, we will need to buy the lens separately. To save some budget, a standard lens(24-70mm lens) is a good range to start, because it has sharp optics and able to capture almost in any environment. So, using the size of the lenses should be enough if we want to capture the surrounding view of Mount Kinabalu or capturing a portrait of the locals wearing traditional attire. However, when we are going for wildlife adventure in Deramakot Forest Reserve, it would be hard for us to capture photos of Orangutans on the tree during our safari walk. Using a telephoto lens (70-200mm) will be sufficient for us to capture photos of Orangutans from afar whilst respecting their space. While we are so into taking pictures of the Orang Utan in action, suddenly the notification pops up telling us that the memory is full? Oh No! That’s a huge bummer. Having only one memory card is not enough, we should be having an extra memory card about 2-8 Gb (depending on your memory usage) and put it in a little protective case (so, we won’t lose it!). An external hard drive and a memory card reader are optional items to bring for travel in Sabah Borneo, provided we can easily find a laptop or cyber cafe nearby. My suggestion would be, bring extra memory cards, so you don’t panic when you run out of memory! Thank God for the technology today, there is a travel tripod that is designed to fold up into a compact package or in some cases, can fit into a carry-on bag. A travel tripod is very useful especially when we are trying to capture photo of Borneo Pygmy Elephants from the riverboat or capture the sunset view from Kudat Beach; capturing photos from unstable movements or ground will result in poor quality photos. A travel tripod is light, durable, easily adjustable, and has the same function as any other three-legged camera support. 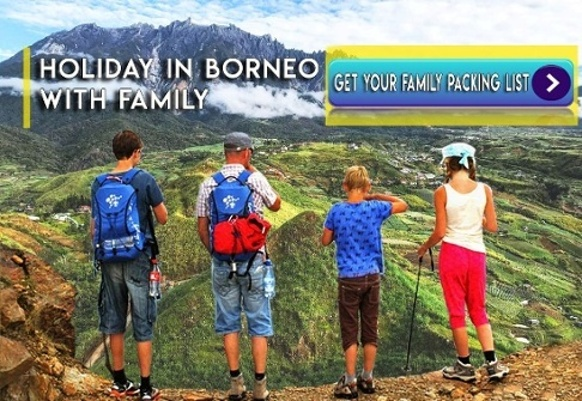 Going for holidays in Borneo, there will be a lot of activities that we can do such as trekking expedition in Long Pasia, overnight trek through Mount Kinabalu, cross-country using a bus, walking around in Kota Kinabalu city, and more. Therefore, it is essential to have a durable photographer bag that can tolerate any various conditions that we may face in our trip in order to protect our camera, lenses and other little accessories, such as lens cloth, card reader, and extra memory cards. No matter how carefully we are in handling our camera and lenses while traveling in Borneo Island, it will still get dirty (boo hoo!). Bear in mind the condition of the camera lenses can affect the image quality, because clean lenses could help to produce sharp and crisp photos. So, if we did not clean the lenses, when we take pictures of Orangutans, it will result in poor quality. Thus, we will need to clean the camera lens regularly in order to take good quality pictures while traveling. Having these 6 essential items for travel photography should be enough for Borneo travel. There is no need to bring a lot of photography equipments(We’re not professional photographers anyway! 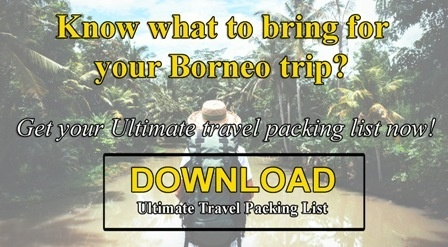 ), because we are going to have fun and capture memories of our vacation in Borneo!